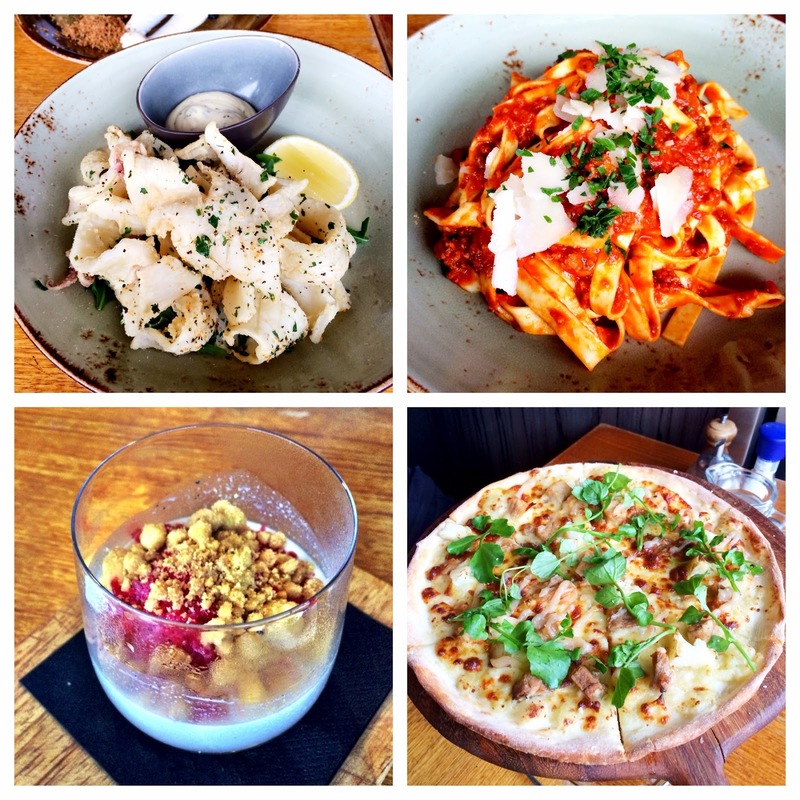 Last week I was invited to try out the recently relaunched Vesta Italian Restaurant, located in the increasingly buzzing Darling Quarter precinct at Darling Harbour. Italian Cuisine and pasta in general excites me so much - after all I am a big fan of carbs, endless servings of bolognese sauce and of course, there's the dessert. Vesta is a Modern Italian restaurant with sleek contemporary interiors and a breezy open outdoor space that's perfect for lunch catchups and evening dinners. I loved the relaxed atmosphere and the friendly service from the staff! To start off, I ordered the Seared Scallops ($16) as an entree, which came with cauliflower puree and lemon crumble. M made a comment on how almost every restaurant utilises cauliflower puree to accompany a scallop dish. Truth be told, I can see why - it's a culinary match made in heaven. The scallops were tender and beautifully cooked, and also plated in a delicate manner. The creamy puree complimented the flavours of the scallops whilst the crumble added textural crunch to the dish. Not bad at all! M's Calamari ($15) was lightly dusted with flour and came with lemon and herb mayo. Each bite was quite crispy and when dipped into the sauce, proved to be a tangy delight. The serving size was also very generous! Nevertheless I must say I do prefer my calamaris slightly more deep fried. As mentioned before, I cannot resist bolognese. Ordering the Tagliatelle Bolognese ($19) was honestly a no brainer. The tagliatelle was cooked to a perfect al dente (it may be a bit too hard for some people's taste palette) and so each spoonful was quite chewy. The slow cooked Bolognese sauce was seriously tasty with a thick consistency and rich tomato flavours - just the way I like it! Next up was the Pork Belly Pizza ($23) - quite the unconventional order for us but we were far too intrigued to give it a miss. Coated with diced pork belly, mozzarella, potato and apple sauce, this pizza was definitely unique in its mix of sweet and savoury flavours. I liked the super crisp thin pizza base and the tender bites of pork belly however at times it was hard getting used to the apple sauce. Overall, it's probably something I'd order once to try out because when it comes to pizzas, I prefer the good old classic options! The highlight for the night was definitely the dessert - isn't it always? The Home Made Daily Panna Cotta ($12) - in this case, raspberry flavoured - was a creamy and decadant indulgence. Topped with raspberries and glorious GLORIOUS crumble, the vanilla panna cotta was silky smooth and sweet but not excessively so, thus making each spoonful more addictive than the last. M and I didn't even bother to converse during the period of sharing this dessert, we just kept digging in until we hit the bottom of the glass jar. Yeah, it was THAT good. Overall we had a great time at Vesta and especially want to say thanks to the owner and the staff for their friendly, attentive service. The ambience and vibe here is great - casual, relaxed and uber fun! The food is nice and fresh with an interesting modern take and there's also an extensie drinks menu. Perfect for happy hour Fridays with work mates or catcups with friends. I am so keen to come back to try the other desserts and order that panna cotta again! For those of you who haven't checked out Darling Quarter, you are seriously missing out. The strip is filled with restaurants and the atmosphere is buzzing with people all the time. Family friendly and close to transport/parking.